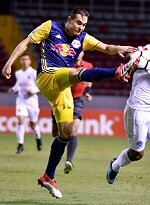 Despite completely dominating the first half, Metro allowed a late penalty kick, starting its 2018 campaign with a 1:1 tie with Olimpia of Tegucigalpa. The game was played in an empty stadium in San Jose, Costa Rica, moved there because of instability in Honduras. Metro's first lineup of the year had newly-minted captain (beware!) Luis Robles in goal, Kemar Lawrence, Aurelien Collin, Aaron Long, and Michael Murillo in defense, Tyler Adams, Felipe, Alex Muyl, Sean Davis, and Daniel Royer in midfield, with Bradley Wright-Phillips (who else?) on top. The first half was a high-press clinic, as Metro owned virtually all of the ball, not allowing any Olympia penetration into their end. They were unlucky not to score multiple times, as Royer plopped a shot just wide, and a clear penalty was missed. In the 31st minute, Royer did get on the end of a terrific BWP through ball, placing it perfectly into the net. Olimpia regrouped at the half, as Robles was immediately called into action, coming out of the net to stop a breakaway. Despite the Hondurans' improvement, it looked like Metro would run out deserved winners... when, in the 73rd, Collin let an attacker get past him, then channeled his inner Damien Perrinelle by bringing him down in the box. Brayan Moya converted from the spot, leveling the game. Marc Rzatkowski and Carlos Rivas made their first-team debuts late in the match, but neither contributed. So, Metro goes into next week's home leg with a disappointing tie, but a crucial road goal... (Oh, those damn road goals!) Hooray for another year? Lineup: Robles, Lawrence, Collin, Long, Murillo, Adams, Felipe, Davis, Muyl, Royer, Wright-Phillips. Subs: Etienne, Rzatkowski, Rivas.